OK: so you've got hold of a Rose suite from a colleague (or Rosie Go, etc.) and you're hoping to you use it on your UNIX system (platform). However, you are using a different version of JULES from the one the suite was written for, and you are also on a different platform from your colleague. Unfortunately, there's no automatic conversion command (at least, not yet! ), but going through the following steps should see you right. In the following, wherever you see "vnZ.Z" please substitute the version of JULES you are using (e.g. "vn5.2"). Download this and put it in ~/roses/ before following the steps below to make it work on your system. STEP 2: If you know your suite is from an older version of JULES, use rose app-upgrade (as described here). These commands can't deal with all differences between versions (e.g. very old versions), but they can often get you most of the way there, so they are worth trying it out. If two ‘Error’ pop-ups appear saying “Could not find metadata for jules-fcm-make/vnZ.Z” and “Could not find metadata for jules-standalone/vnZ.Z” (they may be behind another window) then you'll need to make the following two changes (click OK to get rid of the windows). Click on fcm_make in the Rose Edit window: In "meta", change it to say “[full path of $JULES_ROOT]/rose-meta/jules-fcm-make/vnZ.Z” (unfortunately, you can’t use environment variables like $JULES_ROOT here: it has to be the full absolute path written out, which you can get from echo $JULES_ROOT). When you click “Apply” the ‘env’ below this tab should change into a ‘Build configuration’ tab. Click on the jules tab: In "meta", change it to say “[full path of $JULES_ROOT]/rose-meta/jules-standalone/vnZ.Z”. When you click “Apply” the ‘command’ below this tab should change into an ‘Execution command’ tab. Check 'Build with NetCDF' is on "yes", then, if they are missing, right-click on it and add two latent variables for the NetCDF include files and the NetCDF library files (remove "Path to NetCDF installation" by clicking on its cog). Put /usr/lib64/gfortran/modules for the include files and /usr/lib64 for the library files. Click on jules → Namelist configuration → Output and check output_dir is “[full path of $OUTPUT]". You may well find that there are several red warning triangles in some of the namelists indicating that something isn't right. Check them all one-by-one and right-click on the red crosses for 'auto-fix' options. Click on File → Check and Save, and close the editor. From my experience, I've found that Rose Edit is clever enough to help with most things, but major 'framework' changes like having a new namelist it can't do (e.g. changing vn5.1 → vn5.2 required two new namelists and I found the Editor couldn't auto-fix that). For these, you will have to (i) search on Rosie Go for a suite that has already been updated (there will always be one), (ii) check it out, (iii) Compare the rose-app.conf files and work out what it is you're missing, then copy it in. and you will need to check each of these paths individually and, if they refer to files you don't have, you will have to download them separately (by which I mean email your colleague and ask for copies). 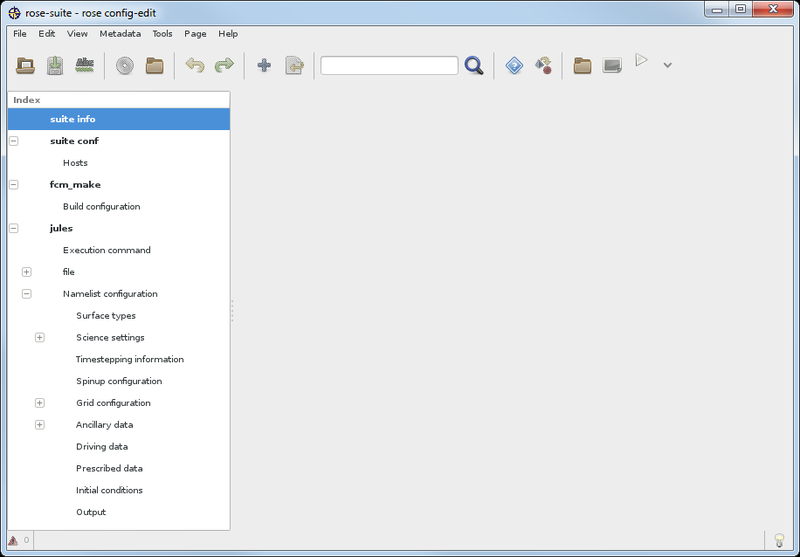 You can alternatively edit these file paths in Rose Edit (e.g. in jules → Namelist configuration → Driving data → file and jules → Namelist configuration → Ancillary data → ... , however there are usually file paths at quite a lot of the namelists and you end up checking down through each one, which can be time-consuming). In Loobos_orig, for example, I need to make sure the paths to tile_fractions.dat, Loobos_1997.dat and initial_conditions.dat are all [full path of $RSUITE]/file/ which can be done most easily by search-replacing in the $RSUITE/app/jules/rose-app.conf textfile. (you can check by repeating the grep command that they have all been correctly replaced). STEP 6: Open the $RSUITE/suite.rc file. If you're in luck, you won't need to change anything here, but there may be complications. You can try simply replacing the suite.rc with a more basic, platform-independent one (like this one suite.rc_.zip), but if that doesn't work you need to delve into this more deeply: see the suite.rc links at the end of this page. All done: this suite should now work on your platform with JULESvnZ.Z.